My dog says that if you love cats, or animals in general, he hopes you'll sign the petition to stop the practice of declawing cats. 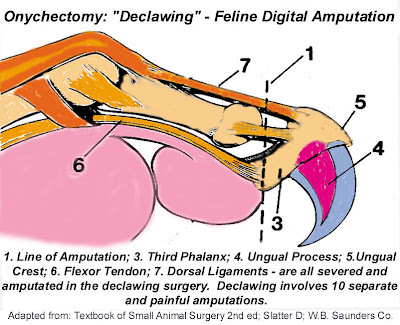 Declawing is a terribly cruel, and unnecessary, surgical procedure where the vet amputates the last joint on each of a cat's toes. It is not a toenail that is being plucked, it is a bone that is being cut into and the last digit of a cat's toe that is cut off. Each and every toe has the tip cut off—bones, flesh, and all. Does this sound painless to you? It sure doesn't to me! There are plenty of alternatives to having your cat declawed, which simply require a little effort on your part. Declawing may seem like the easy solution to stop an overzealous scratcher, but it is quite simply the cruel solution. To sign the petition to stop declawing, click HERE. You are most welcome, Babz. Thank YOU for caring enough to start the petition in the first place. Three woofs for Babz! Woof! Woof! Woof! What a compassionate dog you are Puddy. There are lots of humans out there who would do well to listen to what you have to say. I have a feeling my cats would like you a lot if they met you. Thanks for taking the time to stop by my blog and make a comment. Very nice of you to say such kind things. I'm sure I would like your cats, too. Cats are fun to watch. No one does crazy antics like a cat! If you and your kitties are ever in the neighborhood, stop on by to say hello. The catnip is on me!